Wouldn’t you say that it is typical of the man? He is even smiling for the photo in front of the companies advert, showing just how clever he thinks he is. The hypocrisy of it does not strike him at all, it shows just how thick and thick skinned he is. It’s fun sending screenshots from your site of Limp Dump policies & hypocrites to my Tory MP. Forcing him into the moral dilemma of tacitly agreeing with the obvious, yet refraining from openly criticising a coalition partner is delicious. Well, he’s a politician, so of course he’s going to be a self-serving so-and-so who knows the best deals that we peasants aren’t told about. Perhaps one of his constituents would like to ask him how it feels saving money on the backs of the poor? Well, come on, everyone. Let a thousand tiny energy suppliers bloom, then we can all join in! Steve: Good idea. Sceptic Squiggly Supplies – could be a co-op? Everybody should switch to Green Star Energy, crybabies. Can they legally refuse us? Back in the late ’80s I was in a private meeting with the Canadian Minister of Finance. The presidents of major oil and gas companies were there (I was the strange invitee). We were discussing the general indebtedness of the Nation, as if something were either going to be done about it or could be or should be done about it (negative, negative and definitely negative according to both policy and theory). One moment I recall is when a senior VIPs said regarding about tax avoiders, “It is everybody’s God-given right to minimize his tax exposure”, which, of course, caused multiple guffaws. But true: the morality and ethics of the land are that rules, once in place, are legitimately available for personal interpretation (within the view of the Courts) to one’s own benefit. The lazy and the fool are on their own. Which is why we disrespect our Regulating Class: it is for thee that I rule, not for I or my friends. George: Once 250,000 people sign up, everyone who switched to them has to start paying the green taxes again. They should raffle to us sceptics, the 250,000th application! I don’t look at this situation so much as tax avoidance but a scheme that transfers the costs of the Eco program incurred by customers of the upstart companies to the customers of the established companies – seems a bit unfair [illegal?]. Seems to be yet another [undisclosed] subsidy of one segment of the industry at the expense of another – or at least its customers. As for Davey, I’d be much more interested in where his investments lie and what real payola is involved. 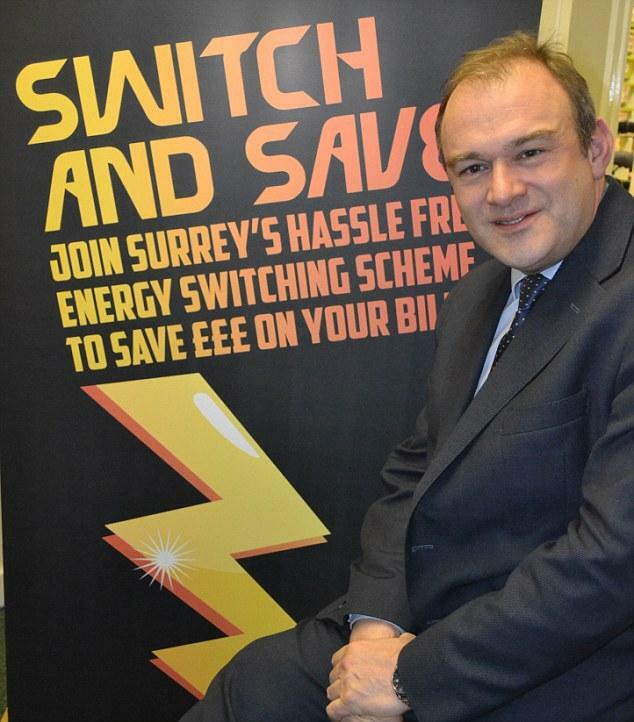 Ah, Ed Davey. The most woefully unqualified member of the cabinet. Clueless and inept. Nice to see his hypocrisy exposed. 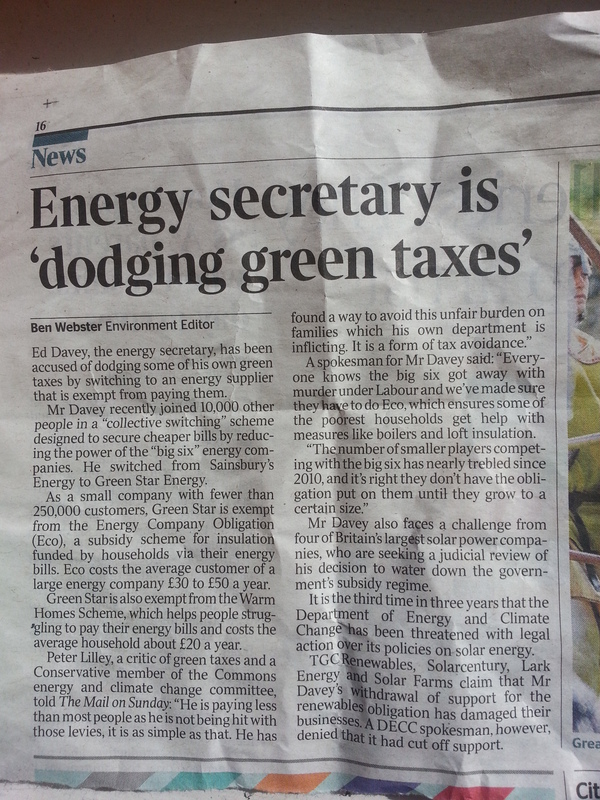 Easy to be self-righteous about green taxes when your rich, even easier when you’re not paying them! Ben K: Indeed, and welcome here at the talkshop. I mean. What self-respecting turkey would stand for gutless crap like that being poured all over it? Just the thought of it is enough to induce severe breakage of wind. I fear I could not draw the line at merely being impolite/casually dismissive and moderately insulting of Davey, so I’d best not comment further! It appears that Mr. Davey’s head has been replaced by a potato. That would explain everything.